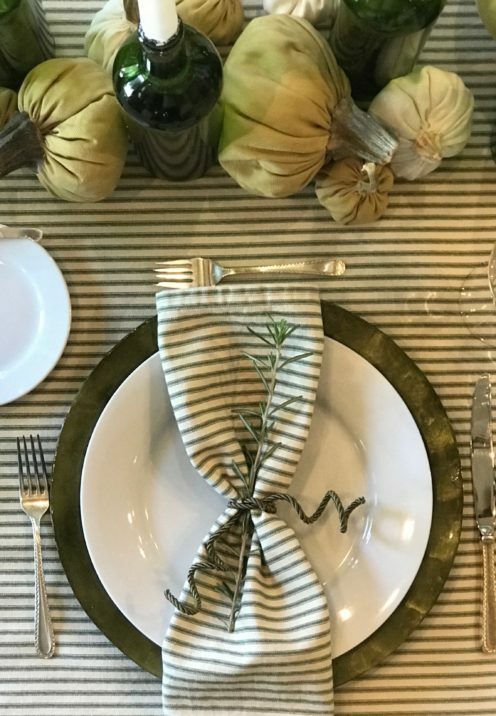 With Thanksgiving around the corner I wanted to share a simple yet lovely Thanksgiving tablescape with you. 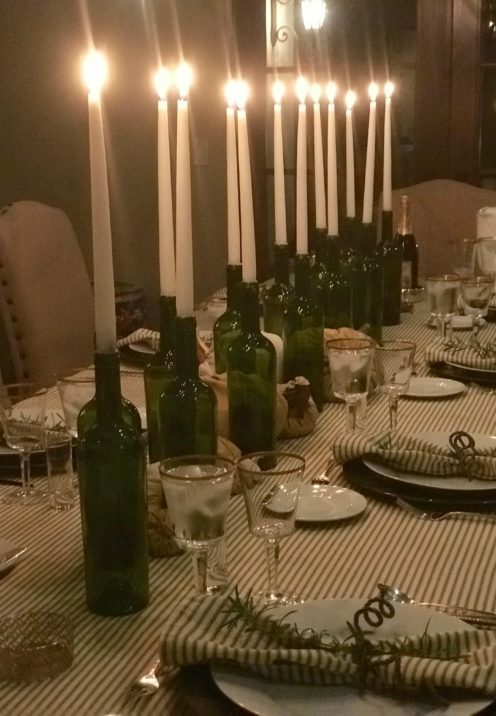 All it takes is some empty wine bottles, a little elbow grease, and some taper candles. 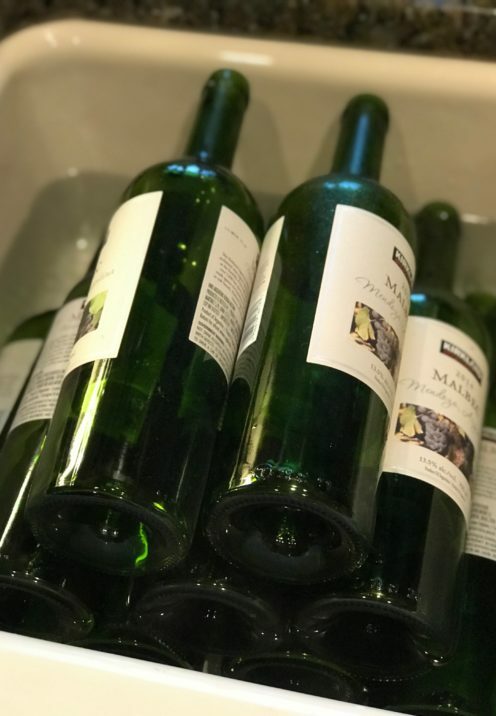 My husband’s choice for everyday table wine is a Kirkland brand Malbec from Costco. I’ve been saving the empty bottles for sometime now, as I had this tablescape plan up my sleeve. 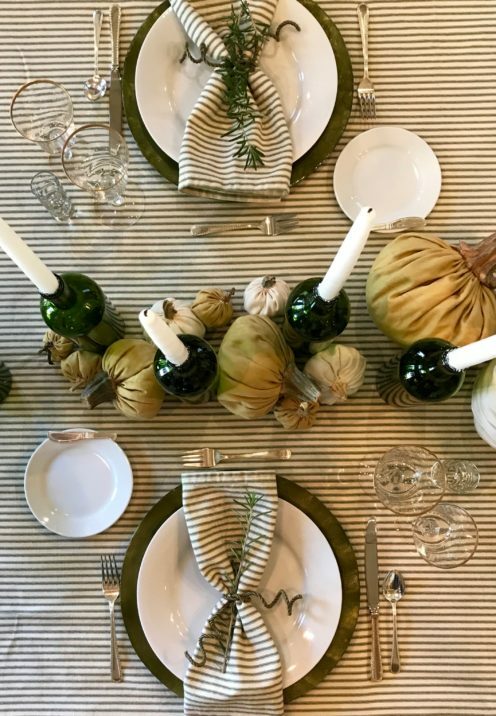 I liked the green color of these particular bottles, which matched my green and ivory striped tablecloth. I also wanted uniformity of size, so I used all the same bottles. 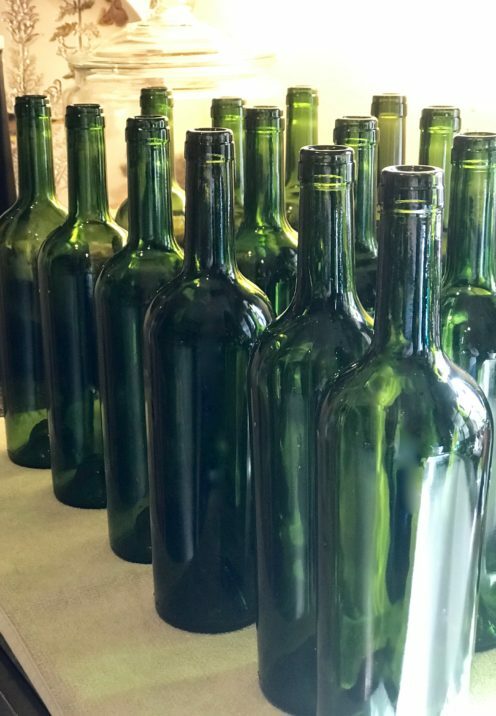 I imagine using a variety of bottle shapes, sizes and colors could be equally as nice. 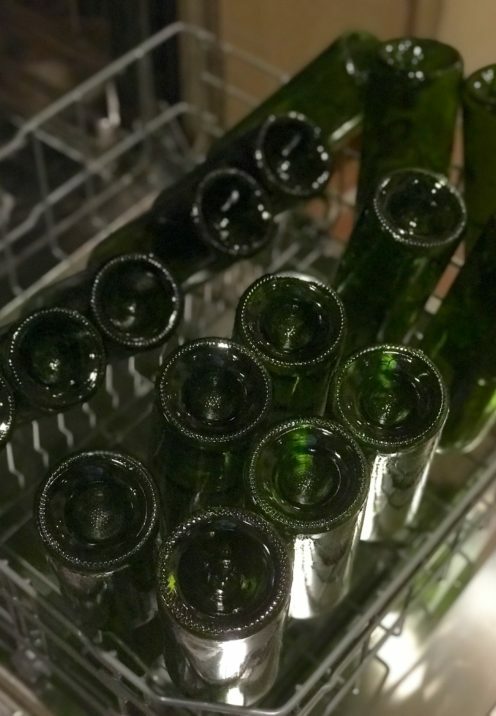 It turns out that by soaking the bottles in hot water the labels peeled off fairly easily with the help of a putty knife. However, some label glue residue was left behind. 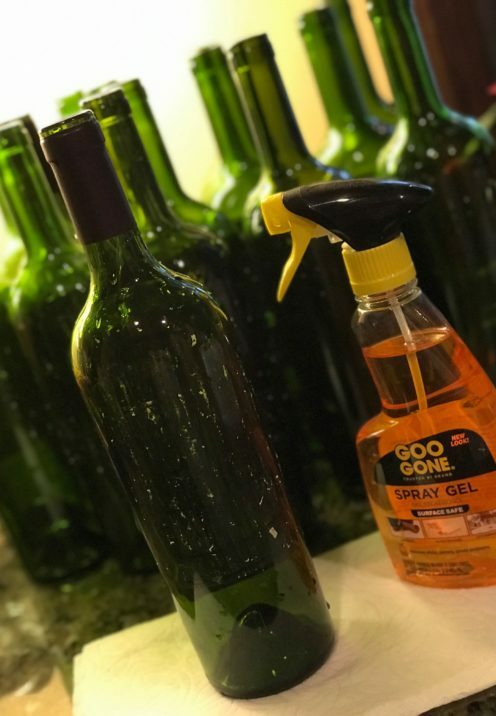 To remedy this I simply sprayed the bottles with a little Goo Gone Adhesive Remover and wiped them clean with a paper towel. 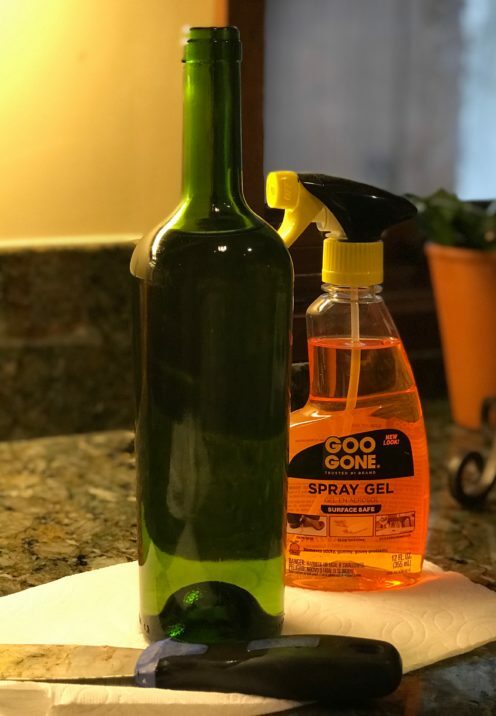 Next, I placed the bottles in the dishwasher and ran them thru a wash and heat dry cycle to extract any remaining wine residue and wash off the Goo Gone. They came out sparkling clean and dry. To the top of each bottle I then inserted a 12″ tall by 3/4″ diameter white taper candle. The 3/4″ diameter of the candle was a good fit for the opening in the bottle. It took a little twisting and turning to fit it in snugly. 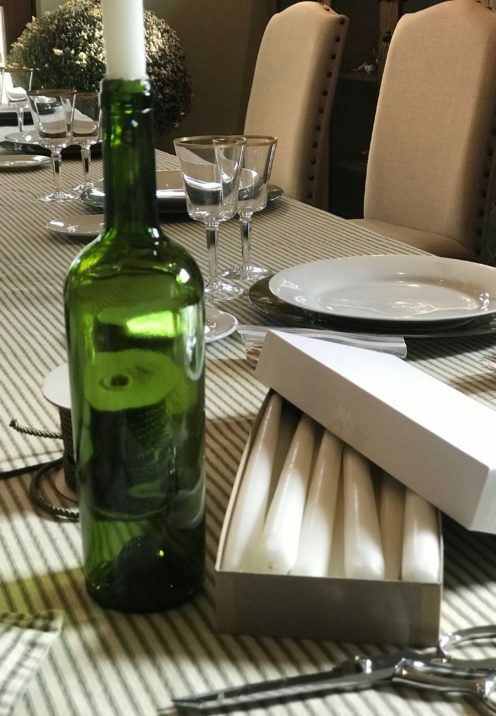 I used dripless candles, but it could also be nice to use candles that would drip wax down over the wine bottles. I just worry about wax getting on my tablecloth in the process. 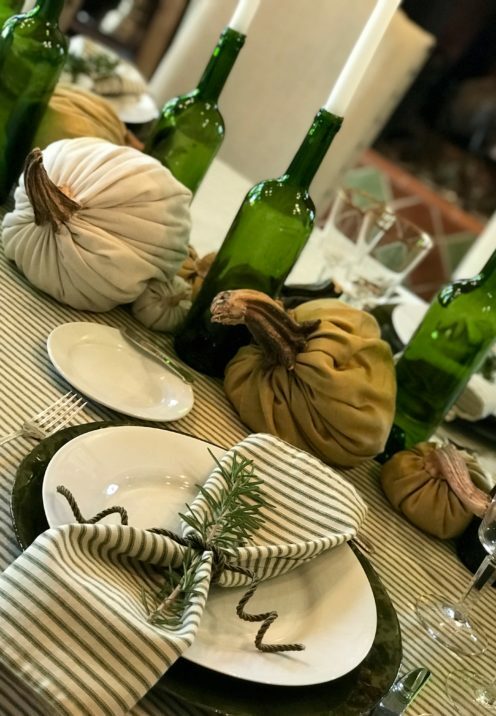 I placed the bottles down the center of my dining table and then added an assortment of my DIY cloth pumpkins in between. 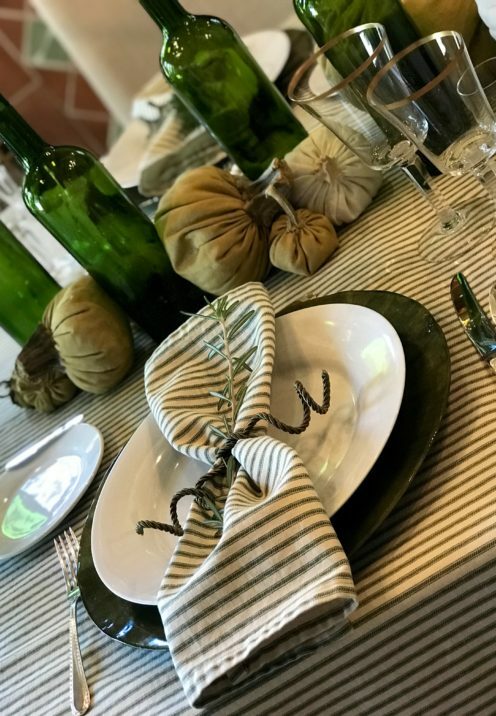 Napkins were tied with some wired cording and a sprig of fresh rosemary was slipped in. Lights were dimmed and the candles were lit just before I invited my Friendsgiving guests to the table. It was a lovely evening that you can read about and get all my favorite Thanksgiving recipes by clicking here.